After graduating with a BA in Marketing and Finance from NYU's Stern School of Business, Joe Messina, a New York City native, started his own marketing and digital design company based in Chelsea. Loving the neighborhood, he immediately moved to the area and has remained in downtown Manhattan since. 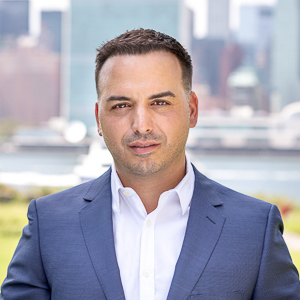 Joe’s innate passion for New York City and seasoned knowledge of downtown inspired him to become a real estate agent. Having merged with The Spiegelman-Rothman Team at Compass, Joe continues to specialize in his hometown neighborhood of Gramercy as well as Chelsea, Tribeca, West Village, Greenwich Village, Soho and Williamsburg. Joe is tuned into the downtown real estate market and everything it has to offer. When he's not hard at work, Joe enjoys spending time with his family and his dog, Frankie.